Granola can be a deceptive “healthy” food if you aren’t careful. While it is a delicious whole grain snack that makes yogurt parfaits and other breakfast foods more interesting, many store-bought granolas are full of sugar and sodium to make it taste better. Instead of swearing off granola, you can easily make your own at home, like this simple peanut butter granola. It is naturally flavored with peanut butter and sweetened with just a touch of honey, plus full of healthy whole grains like oats and crispy brown rice cereal. It can be made with just a few simple ingredients in under 30 minutes. Whole grains and and nuts should be part of a blood pressure-friendly diet, making this a delicious and healthy snack. Heat oven to 350F. Line a baking sheet with parchment or a silicone baking mat. In a large bowl, stir oats and cereal. In a smaller microwave-safe bowl, heat coconut oil in the microwave until pourable, about 20 seconds. Stir in peanut butter, honey, and vanilla. Pour the mixture over oats and cereal and stir until evenly coated. Spread mixture onto prepared baking sheet in a single thin layer, trying to make sure there are no holes where you can see the baking sheet. Bake for 10 to 15 minutes or until edges are slightly browned. Remove from oven and let cool for 15 minutes, without stirring. Once granola has cooled, break into pieces. Store in an airtight container on the counter for up to 1 week. You can use quick-cooking oats if you do not have rolled oats. To get big, chunky clusters, spread granola into a thin layer on your baking sheet without holes—you don’t want to see the baking sheet through any holes. Then DO NOT stir while baking or cooling. After granola is cooled, you can break it into pieces. Peanut butter is a good source of healthy unsaturated fats and protein—just make sure you read the label on it. You want ideally want one made with just peanuts, but make sure there isn’t any added sugars or oils. 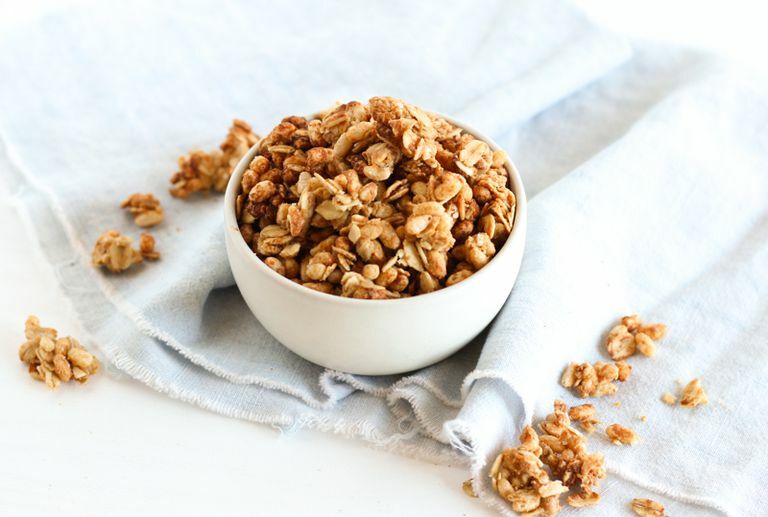 This granola is a great snack for topping low-fat yogurt and fruit or for portioning out into small containers to munch on. You can also try it on strawberry sweet potato toast or a peanut butter banana yogurt parfait.